I love London history, just the fact that I can walk streets that follow the same pattern as the city known to Romans thousands of years ago is more than a little exciting. And I love books - which can't be news - who would bother writing a story if you didn't. But there are all sorts of history. And I've written before about telly, which is another, almost life-long romance, so this post won't come as a surprise. And I believe it's even more important to consider this history when the BBC, one of our better inventions, is being bashed from all sides. In spite of horrible Jimmy Saville and the horrible sexism of the twentieth century (and I'm sure it was the same in many, many offices and workplaces up and down the land) I still think there is no better broadcaster than the BBC. You may hate soaps or Strictly, you may think that at the moment the Americans make all the best drama, but think hard; no Radio 4, no CBBC, series that don't resolve just so you can get the audience to buy the next box set. Really? For the past ten weeks or so I have been working mostly out of BBC Elstree studios. 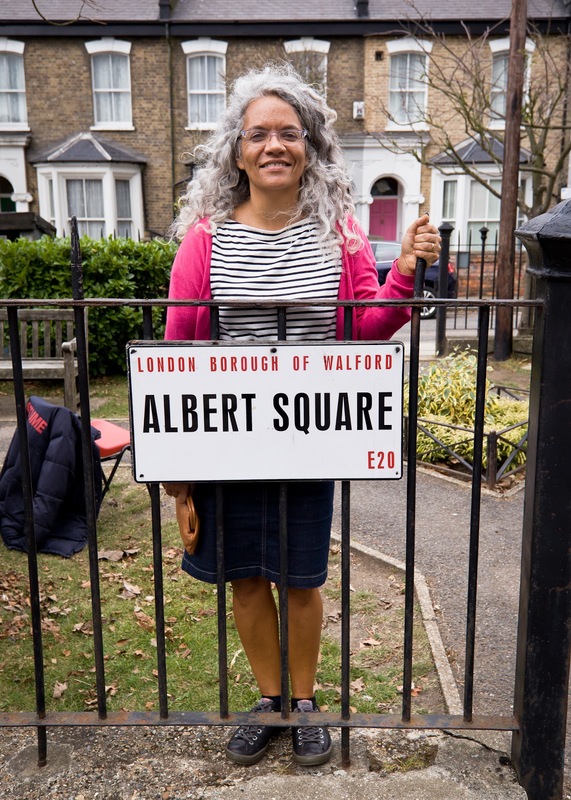 That accounts for the me in Albert Square photo at the top of the page. But Eastenders is rather a Johnny come lately as far as the history of the building or in fact of London's part in the history of moving image. I grew up near enough to Alexandra Palace, the home of TV, but to be honest as a kid I was more interested in the remains of the Prisoner of War Camp and the old disused railway than any kind of TV history. In the early twentieth century there were loads of film studios all over London. These included Gainsborough in Islington, where the young Alfred Hitchcock started his career and Margaret Lockwood played the girl gone bad in The Wicked Lady, as well as Ealing and Denham, Pinewood, Teddington, Twickenham and Shepperton and many more. 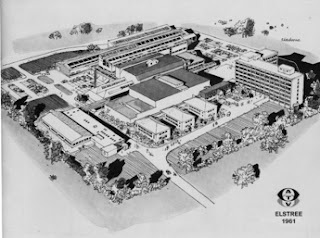 The studios in 1961 when they belonged to ATV and this is basically what the lot looks like today, except without the long low buildings along the top left. This is where Albert Square is. BBC Elstree was built as Neptune Studio in 1914, there was a thriving film industry growing up on the edge of town and these days there are still two giant studios in this rather unlovely suburb. The old Elstree studios across the road from the BBC was where hundreds of blockbusters were filmed including Indiana Jones, Star Wars, several Bonds, a Kings Speech and rather less excitingly, Big Brother. BBC Elstree was home to many films in the 30s, 40s and 50s, stills from them line the corridors, women in interesting outfits, from tailored suits to assemblages of fruit, men in broad shouldered suits who are vaguely familiar. In the 1950s the place was bought by Douglas Fairbanks Junior who made loads of successful tv shows, including Robin Hood and The Saint. The BBC didn't buy the plot until the early 80s, and made Auf Weidersehn Pet on the building site that became Albert Square. 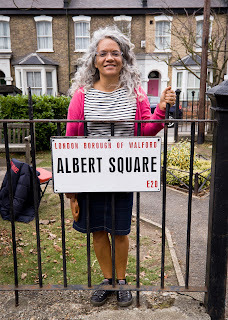 What's lovely about BBC Elstree isn't the giant 1960's tower block that doubles as Holby City hospital, or the Eastenders lot built as a kind of Alice in Wonderland London square. It's not walking past the open door of the Holby body shop with its latex surgery dummies, or seeing the hopefuls waiting in casting. But the knowledge, just like that Roman street feeling I tried to describe in the first paragraph, of what went on here, right under my feet. From Powell and Pressburger to The Double Deckers, from The Muppet Show (the original) to Grange Hill. It makes me feel a little part of something. And I am sad enough to love it. PS In case you wonder what I am doing at Elstree I am on the BBC Writers Academy http://www.bbc.co.uk/writersroom/about/the-writers-academy which is like narrative boot camp. People say writing continuing drama is a doddle, I think there are loads of similarities with childrens fiction in that it's much harder to get right than you imagine and everyone thinks they can do it. What fun! And the BBC Writers Academy sounds great, too! Write us a report when it's over? Love it!! My mum's cousin used to work at the film studios there.She worked on the sound effects for the Star Wars films. After she died we had a huge party for her (she was a massive presence in our family) & held it at Elstree. It was fab going there. I'm a North Londoner too. When I was little I used to think Ally Pally was the Eiffel tower and I could see France! Enjoyed finding out about Elstree - never realised the Holby tower block/car park was there. Feeling part of so much television history must be incredible.